The Stan Hywet Hall and Gardens in Akron is a beautiful, 70-acre National Historic Landmark that features sweeping gardens and land, plus the nation’s 6th largest historic home and other historical buildings. It is a coveted wedding and event destination, with many Northeast Ohio couples choosing to tie the knot on this breathtaking property. 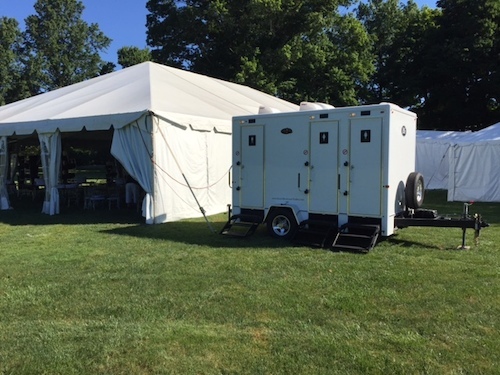 At one recent outdoor wedding, Shower Trailer had the privilege of providing our Grand Luxury Three Station portable restroom for the event. We worked with wedding organizers to choose facilities that would fit the upscale occasion and handle guests comfortably while also blending in seamlessly in the background. The Porta Lisa was the perfect solution with its beautifully appointed wood grain style floors, air conditioning, hot and cold running water and stereo system. We dropped off our clean, well-maintained unit the morning of the ceremony, and picked up the morning after. Guests were able to enjoy the entire happy event out of doors without worry. 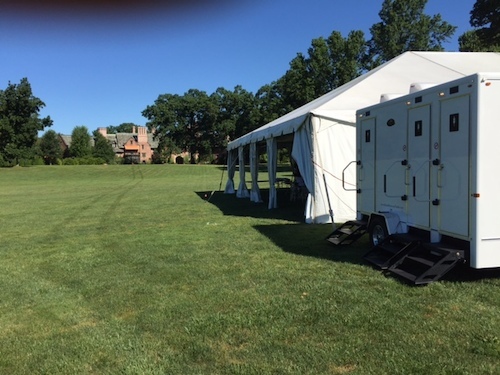 To learn more about luxury portable restrooms for weddings, parties, fundraisers and events, contact the experts at Superior Speedie today!